This trampoline ladder from Texas Trampoline makes it safe and easy for kids to get on and off of the trampoline. 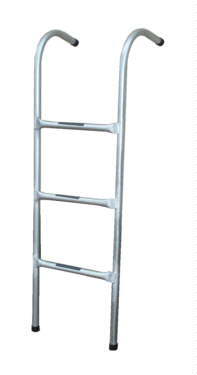 Our heavy duty trampoline ladder is all galvanized with 3 slip resistant steps. The ladder is designed to hook securely over the frame but under the safety pads. Not only will you save wear and tear on your safety pads, but your kids will be much safer climbing down rather than jumping off the trampoline to the ground. Keep it Safe and Keep it Fun! Fits the 15’x9’, 17’x9’, 17'x10' rectangular trampolines. Also fits other brands that = 32" to 36" tall. Trampoline Ladders should be removed and stored inside when not in use.